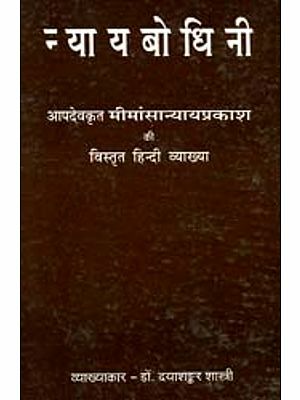 The Bhasa-parichheda with its commentary, the Siddhanta-muktavali, by the same author, Visvavatha Nyaya-pancanana Bhattacarya, is a manual on the Nyaya-Vaisesika philosophy, which is extensively read throughout India by all who want to get a fair knowledge of the subject within a short compass. Though intended for beginners, it is a pretty difficult book, the chief reason for which a short compass. Though intended for beginners, it is a pretty difficult book, the chief reason for which is its extreme terseness. In 1850 Dr. E. Roer published as English edition of the Bhasa-pariccheda, with extracts from the Muktavali, which is long out of print. 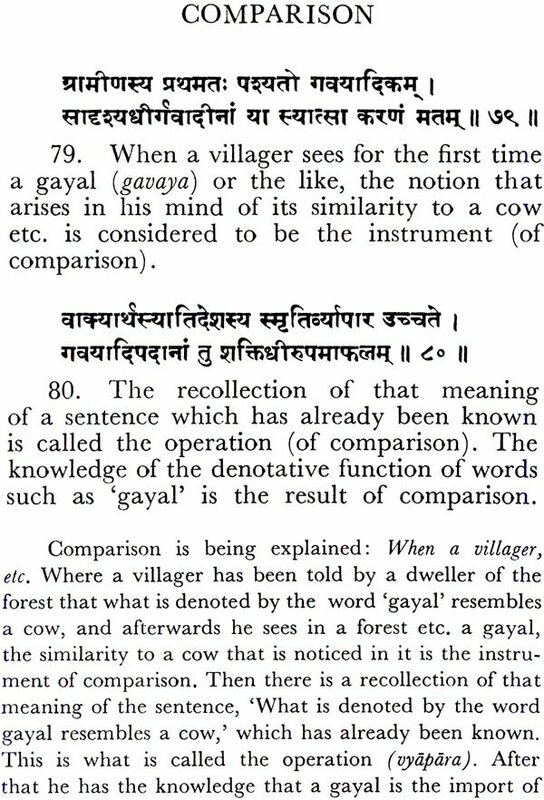 An English rendering of the work with the Muktavali was therefore overdue. Some consider books on Navya-Nyaya untranslatable into English because of the bewildering intricacy of their language. However true of the more advanced works, it may not be true of a treatise like this. For those who are not well versed in Sanskrit, an English version of it is sure to be of great help. Really this is a task that should have been undertaken by scholars. But since no one has so far done it, I have ventured to make an attempt- with what success it is left to the readers to judge. Students of Nyaya, however, should always remember that, no matter how good a translation is, they must be ready to do hard thinking for a proper understanding of the subject. In the preparation of this book the gloss Dinakari and its scholium Ramarudri have of course been of inestimable aid. I have also received much help from Pandita Upendracandra Tarkacarya, Kavay-Vyakarana-Purana-Samkhya-Vedanta-Saddarsana-tirtha, of the Catuspathi at the Belur Math, with whom I studied the book. I am deeply indebted to Dr. Satkari Mookerjee, M.A., PH.D., Lecturer in Sanskrit, Pali and Philosophy in the University of Calcutta, who has kindly revised the manuscripts, added a few notes and written a scholarly Introduction. Some other friends have assisted me in different ways. I have also got substantial help from the Bengali version of the book by the late Mr. Rajendracandra Sastri, M.A. The book will be of most profit to those who will go through the Muktavali in the original, a small edition like the one published by the Nirnaya-sagara Press, Bombay, serving the purpose. But it will be quite helpful to others also. Of the different readings, the one that seemed most appropriate has been followed. I have tried to make the rendering as literal as possible without being unintelligible. The catchword of the text quoted in the commentary are taken from the running translation and are given in Italics. The text has been punctuated, and copious notes have been added to elucidate difficult passages. References have been given to most of the quotations. 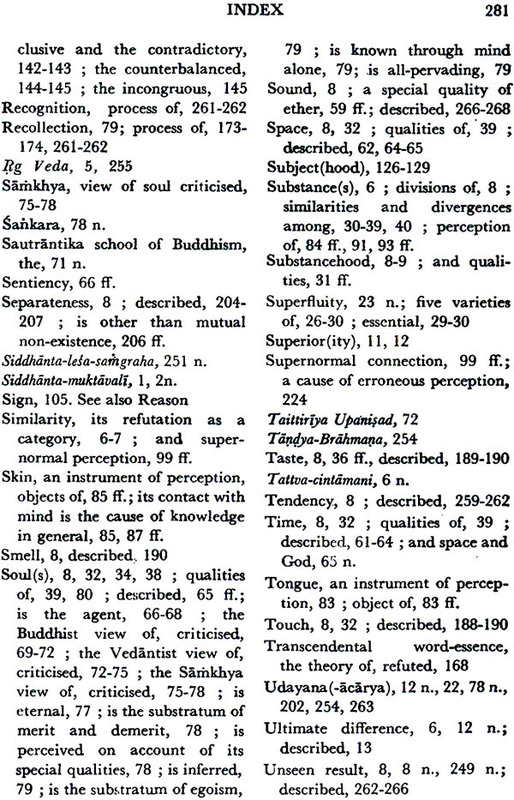 The Index and the Glossary of Sanskrit terms will, it is presumed, be found useful. It is hoped that the book will facilitate the study of Nyaya, and be widely read by the interested public both in the East and in the West. The Bhasa-pariccheda together with the author's own gloss called the Siddhantamuktavali was written by Visvanatha Nyayapancanana, who flourished till the early part of the seventeenth century A. D. at Nava- dvipa, Of all the manuals of syncretic character on the Nyaya- Vaisesika school, the present work is the most popular and most extensively studied in India. 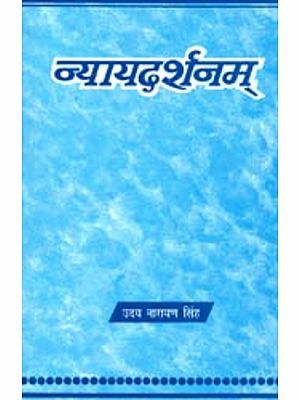 The popularity of the work is not due to simplicity or brevity, but rather to its comprehensive treatment of most of the important topics and problems that exercised the minds of the exponents of the Navya-Nyaya school for several centuries. It is admittedly a difficult book, being written in the later style of Navya-Nyaya termin- ology, which was developed by the school of Nadia logicians. What constitutes its chief merit and title to the celebrity it enjoys is the fact that it admirably sums up the latest results of scholastic lucubrations of this school. The author flourished after Raghunatha Siromani, Mathuranatha, and Jagadisa, and he has naturally utilised these masters. A study of this work is thus a sure propaedeutic to advanced study and makes the student fairly well-posted in Navya-Nyaya dialectics. 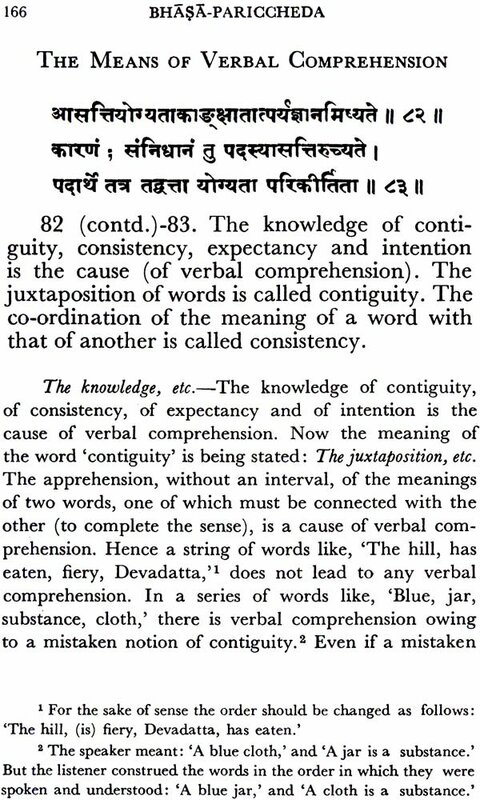 Visvanatha follows the plan of Prasastapada in his treatment of the Vaisesika categories and their rela- tions, although his exposition embodies new contribu- tions. In the discussion of the necessity and utility of invocation of divine help called Mangalacarana, he follows in the footsteps of Gangesa Upadhyaya, who elaborately discusses the question at the very beginning of his magnum opus, the Tattvacintamani. 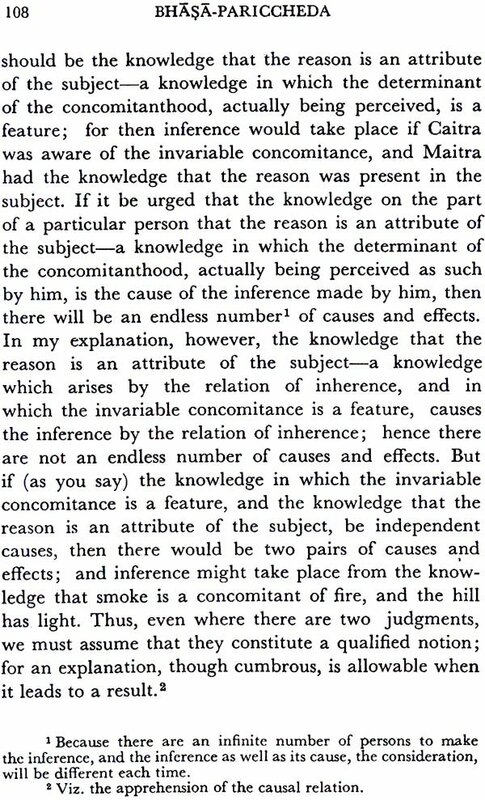 Although the dissertation may appear to be a jejune discourse and a scholastic survival, it does not lack philosophical interest, inasmuch as it serves to bring out the implica- tions of the law of causation by explaining the anomalies as due to factors not patent to observation. It emerges from the discourse that there is no play of chance, and the sequence of events is rigorously governed by the law, which does not brook any lapse or exception. 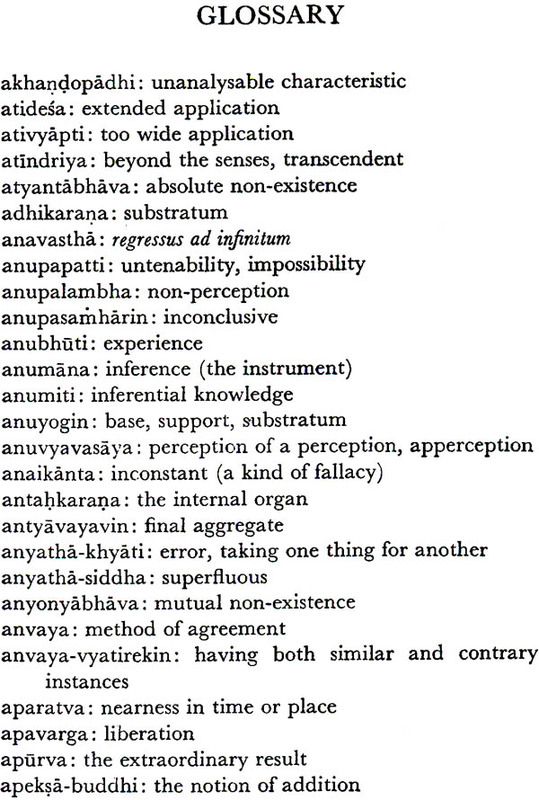 Then again, Visvanatha's summing of the proofs of God's existence, although extremely brief, stimulates the curiosity of the student for fuller knowledge, which can only be satisfied by a study of the Nyayakusum- anjali, Gangesa's Isvaranumana and advanced works of other schools. The refutation of sakti (energy) and sadrsya (similarity) advocated as separate categories by the Mimamsists is effective, although the advanced student who has gone to the sources will feel that the treatment is meagre. But it should not be forgotten that the book is meant for beginners, and the student must be thank- ful that the author has raised all the important topics and given us the crystallized results. We may refer to the author's definition of substance by way of illustra- tion. A study of the definitions propounded by the different philosophers of this school will show the evolu- tion of thought that took place in the course of several centuries from. the time of Prasastapada, Sridhara, Udayana and Vallabha down to Visvanatha. Prasasta- pada's definition of substance as the substratum of qua- lity, endorsed by Sridhara, has been severely attacked by Sriharsa and Citsukha. The definition fails to apply to a substance which is devoid of a quality at the moment of its origination. The second difficulty is that we cannot distinguish a quality from a .substance in the light of this definition. If the logical predication of quality is the criterion of the subject being a substance, then this criterion will apply to qualities also. 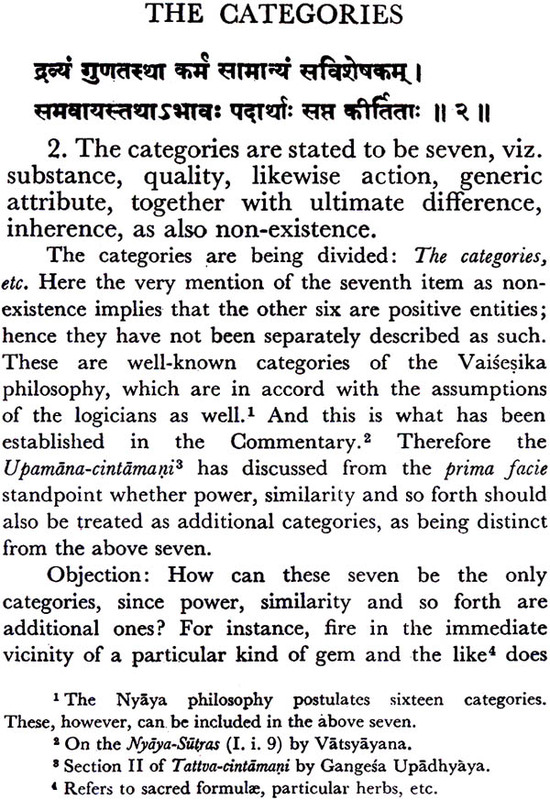 Thus, in the proposition 'Qualities are twenty-four,' the number of twenty-four, a quality, is predicated of 'quality,' and the definition would make substance of it. Sri Vallabhacarya, the author of the Nyayalilavati, a work of the highest authority on Vaisesika philosophy, which has been commented upon by Vardhamana, Sankara Misra and Raghunatha Siromani, to name only the prominent masters, has propounded an amendment of the definition in the following terms: 'Substance as the substratum of quality is to be understood as that which is never the substratum of the absolute non- existence of quality as such.' It does not fail to include the substance at the first moment of its origin, as, though devoid of quality, the non-existence of quality in it is not absolute. But this amendment too has been roughly handled by Citsukha and has been shown to extend to unwarranted cases, e.g., the non-existence itself, as it is not the substratum of this non-existence, since a thing cannot function as its own substratum. Moreover, the charge of unwarranted extension to qualities is not rebutted, for number is predicable of quality, as shown above. The explanation of this predication on the basis of co-existence of the subject and the predicate in the same substratum is an argu- ment of despair. The subject and the predicate are not supposed to stand in the relation of co-existence in any other case. The predicate is affirmed of the subject as something belonging to it, which in the ultimate analysis is found to be possible on the basis of identity of denotation. No reason is assigned for departure from this recognised mode of relationship in the pro- position 'Qualities are twenty-four in number,' save and except the hypothesis that quality cannot be the sub- stratum of another quality. But this is an assumption which requires to be established by proof. The nature of things is to be determined in consonance with experi- ence, and experience articulated and logically deter- mined resolves itself into a judgement. A judgement consists of two concepts bound by a relation; and when the form of judgements is identical, there is no ground for the assumption of an unwonted relationship in deference to a favourite theory. So the explanation of the subject-predicate relation as not one of denotational identity but of co-existence begs the question and as such is unacceptable. Moreover, 'the non-existence of quality' is an ambiguous expression. It may mean non-existence either of one quality or of all qualities put together. The non-existence of one particular quality is consistent with the presence of another quality, and the non-existence of all the qualities is predicable of each and every substance. So the defini- tion proves absurd, as it would not apply to any sub- stance whatsoever. Visvanatha had in view all these difficulties and so formulates a definition which avoids these pitfalls. 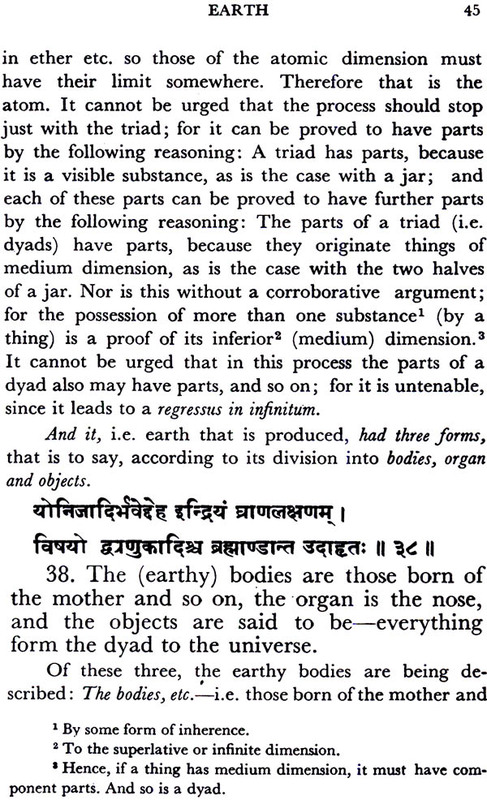 He found that the alternative definition of substance as the substratum of the substance-universal (dravyatva) was of no help, as the presence of the substance-universal in a mustard seed, a mountain, a liquid and a gaseous substance, which possess such a bewildering variation of physical qualities, is not a matter of undisputed perception. It can be helpful provided an independent proof of substancehood is offered. Visvanatha offers this proof, not by appeal to experience, which is non- comittal, but by working out the implication of causality. Although physical qualities like colour and sound are not universally predicable, conjunction or disjunction at any rate is predicable of all substances. A substance, whether a product or an eternal verity, must come into the relation of conjunction with, or disjunction from, another substance. Conjunction and disjunction, being events in time, must have a substra- tum in which they can inhere as their cause and support. This is called inherent cause to distinguish it from other types of causes, the difference of types of causes being determined by the relation it bears to the effects concerned. It is the postulate of Nyaya- Vaisesika metaphysic that a cause cannot be a simple entity. In point of fact the Naiyayika does not believe in the existence of uncharacterised simples. The very logical necessity of a real being possessed of a distinctive identity; the forfeiture of which will make it cease to be real, pre- supposes that this self-identity must have a definitive qualitative content in it. This definitive character must be uniform in all reals which fall into a class and behave in the same way.